Early in the morning (7:18 a.m. 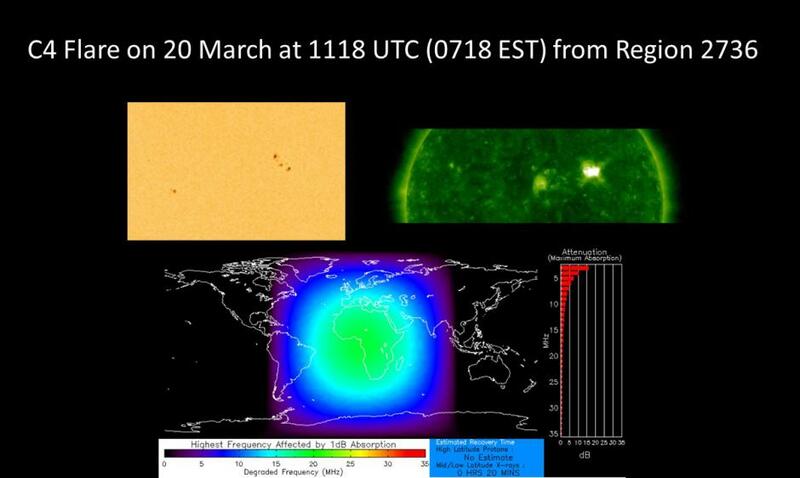 ET) on Wednesday, March 20 the Space Weather Prediction Center (SWPC) observed a C4 Flare. It erupted ‘from a recently emerged sunspot group (Region 2736)’ according to the SWPC. 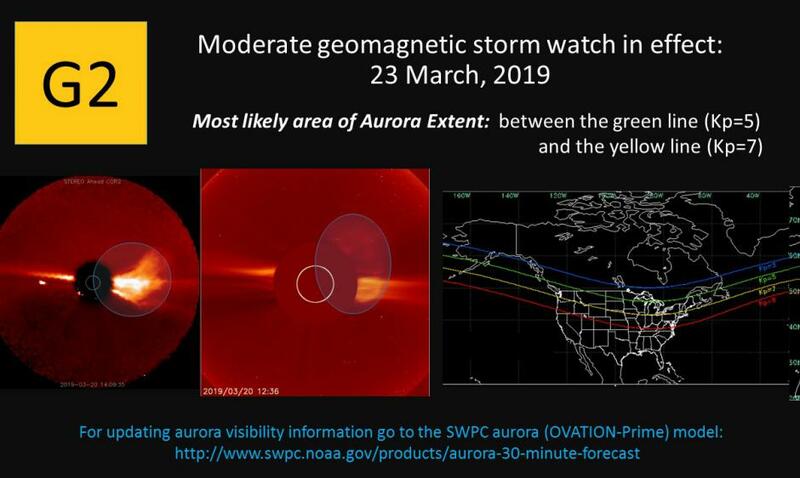 After further observations, SWPC said a G2 (moderate) geomagnetic storm watch is in effect for the 23rd of March. After the solar flare occurred on the sun, it ejected what’s known as a CME. That CME is moving toward Earth. 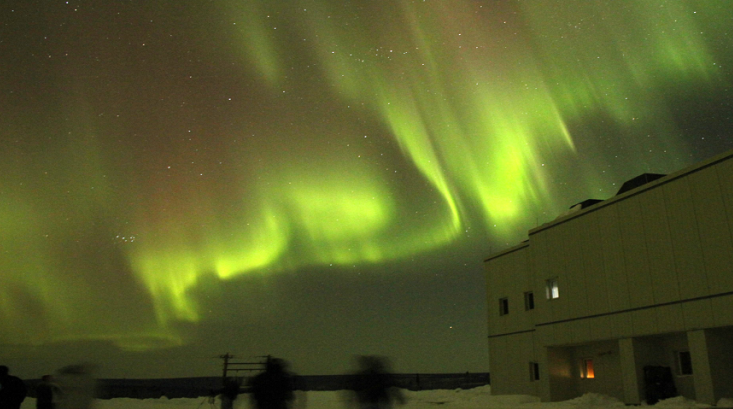 Often, we must monitor how strong it is because it can give us auroras, but also disrupt the power grid, spacecraft operations, and users of radio signals. The above image is greatly useful. It is a forecast from SWPC showing the most likely areas to see the Aurora Borealis, a.k.a. the Northern Lights here in the Northern Hemisphere. According to Wednesday’s forecast, the aurora could reach down to the green or yellow lines! That would take it far through Canada and into the northern United States! As it stands now, the greatest extent of the aurora is expected to be between 11 a.m. ET and 8 p.m. ET. Thus the farther east you are, perhaps the better chance to see the Northern Lights when it gets dark on Saturday evening. *Updated forecast* A ‘3-hour Kp’ of 5 is likely to last between 8 p.m. ET Saturday until 2 a.m. ET Sunday, or 11 p.m. Saturday Pacific. So look at the image above and find the green line (shows Kp 5) and that’s where we could see the aurora! That line goes from northern maine to Michigan, Minnesota and North Dakota, finally to Montana and easily, Alaska. Once again, Saturday night the 23rd of March is the time to look north and try to catch a view of the Northern Lights here in North America. As far as radio blackouts go, there is a slight chance of minor to moderate radio blackouts between March 21 and 23. We’ll update you if any of this changes!